1. Heat griddle over medium-low heat and lightly grease with vegetable oil. I personally don't like to use butter because it burns easily, plus we use butter on the top of our pancakes after they cook. Though I'm no heath food commando, I am trying to be conscious about eating healthier so I've decided I don't need to butter my pancakes twice. 2. 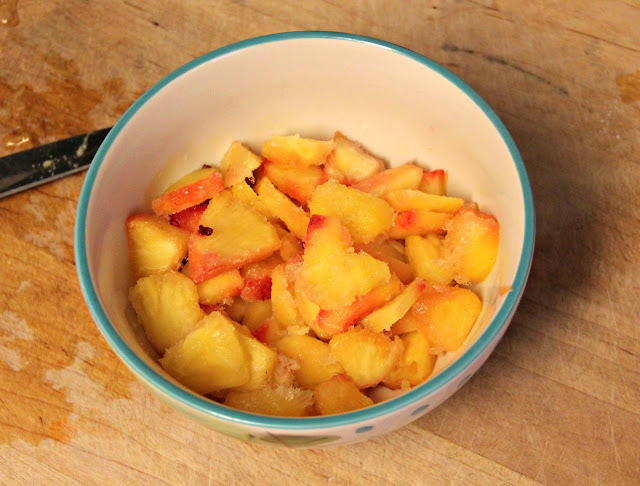 Place sliced pineapple in a bowl and toss with 1 Tablespoon of the sugar. You can use fresh, canned (drained), or frozen pineapple. I keep fresh-frozen fruits in my freezer for smoothies (plus I think frozen always tastes better than from the can) so frozen is what I used. 3. Mix together the biscuit mix and sugar. Then add your wet ingredients: milk, eggs, vanilla, and vegetable and whisk until the ingredients are incorporated. You don't want to go too crazy here. Light mixing makes for lighter pancakes. 4. Pour batter onto the hot griddle and top immediately with sliced pineapple. 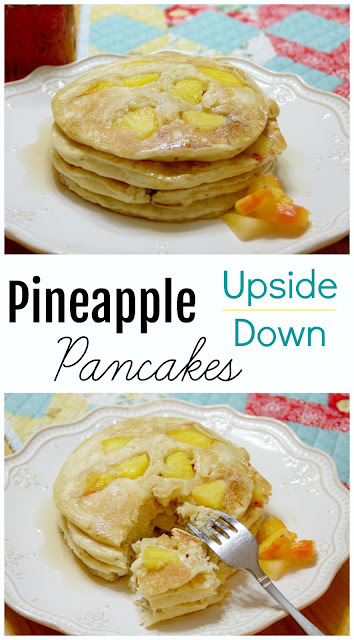 We have four hungry kids at our house so I chose not to cover the entire pancake with pineapple (I also knew they wouldn't settle for just ONE pancake so I wanted to stretch out my pineapple) but you can use as little or as much as you'd like! 5. 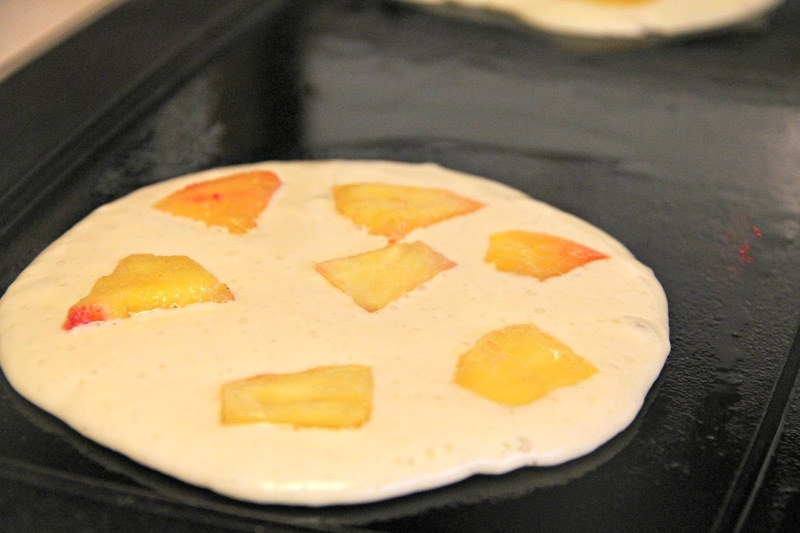 Allow pancake to cook thoroughly on one side until the sides are firm. I like to lift up the sides to loosen my pancakes and to check their doneness before I flip. Flip pancakes to the other side and allow to cook about a minute or so more. 6. 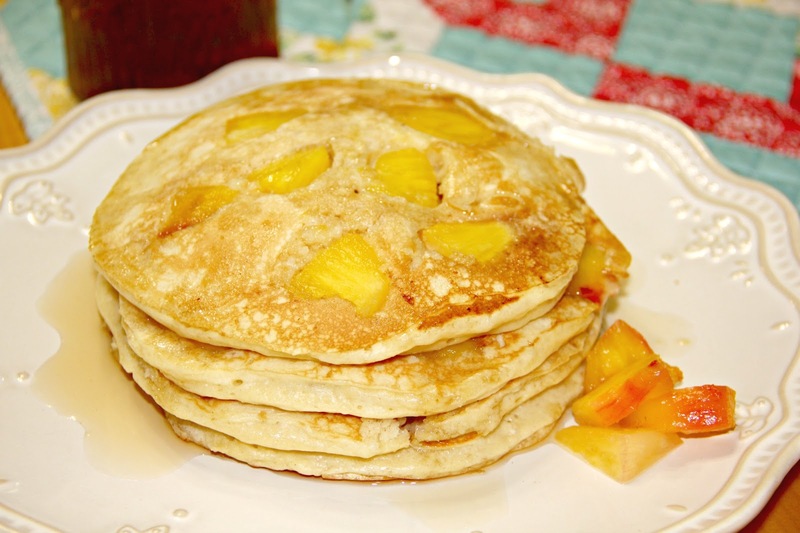 Stack up those pancakes and grab a fork! We served ours with butter and warm 100% maple syrup but you could also top yours with powdered sugar, or whip cream! Anyway you serve them you'll find them delicious! My boys are not huge pancakes and NEVER ask for seconds but this time, they both wanted more! Enjoy this recipe from Our Southern Style? Click HERE for more recipes!